BLOOMINGTON – For some, the State Finals will be the final race of a career. For others, it will be a stepping stone to next season. For all of the area track athletes competing at Indiana University this weekend though, it will be a special moment as the state’s best come together. The area will see its fair share of representation with the Girls’ State Finals Friday and the Boys’ Finals on Saturday at the Robert C. Haugh Track and Field Complex in Bloomington. The contingent on the ladies side will be led by 10 competitors from Warsaw, along with NorthWood standout Erica Stutsman. Set to lead the way for Warsaw, which won its seventh straight regional team championship at Kokomo last week, are its stellar senior tandem of Mia Beckham and Emma Bohnenkamper. Beckham is slated to compete in the 1,600 and the 3,200. 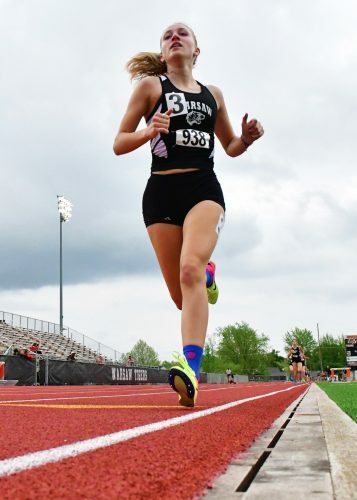 The Butler University recruit, who also competed in the cross country State Finals last fall, placed seventh in the 1,600 at the State Finals a year ago. Bohnenkamper was the regional champion in the 1,600, while Beckham won the 3,200 title. Warsaw senior star Mia Beckham will try to reach the awards podium again this year at the State Finals. Senior Lexie Day is also making a return trip to the State Finals for the Tigers. Day, who was also a standout on the volleyball court back in the fall, will compete in the high jump. Day, who placed second in the regional, placed 15th in the event a year ago at State. Senior Abbi Curtis will compete in the 200-meter dash and junior Makayla Clampitt is in the 100 for Warsaw. Coach Megan Davis’ talented team will also have a pair of relay teams in the state meet. The 4 X 800 team of junior Remi Beckham, freshman Adree Beckham, junior Ashlynn Hepler and junior Angie Sanchez-Vijil will run, along with the 4 X 400 team of Remi Beckham, Adree Beckham, Sanchez-Vijil and junior Maygan Bellamy. Stutsman will try and leave one final mark in the 800. The NorthWood senior came out of nowhere a year ago to earn a third-place finish in the event at IU. Stutsman won the 800 title at Kokomo last week and has came back after suffering a broken leg in a skiing accident during the offseason. The State Finals for the ladies is set to begin at 3 p.m. Friday with the pole vault, long jump and discus. The 3,200 relay finals start the events on the track at 4:15 p.m. 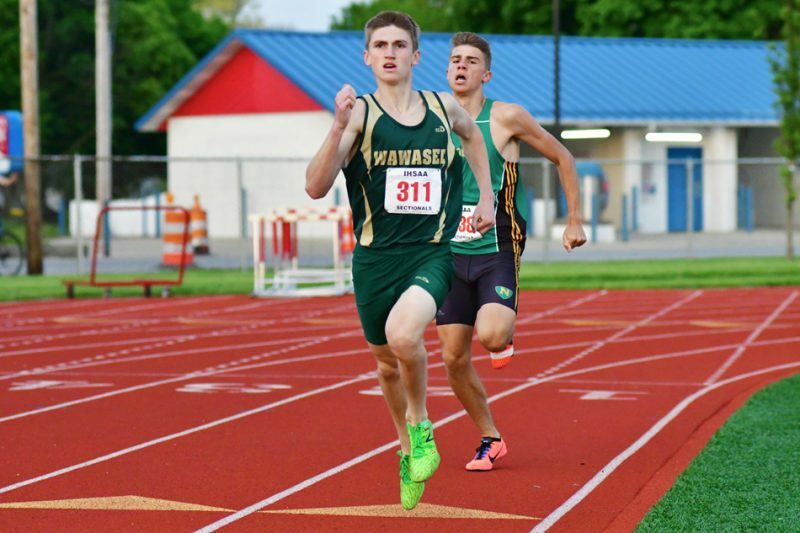 The local boys contingent headed south will be led by Wawasee standout Luke Griner. The junior is looking to race his way back on to the awards podium (a top nine finish) for the second straight year. Griner won the 800 title at the Warsaw Regional last week. The talented ace placed ninth at the State Finals in the event a year ago with a time off 1:55.49. He is seeded fifth going into the event on Saturday this year with a time of 1:55.15. 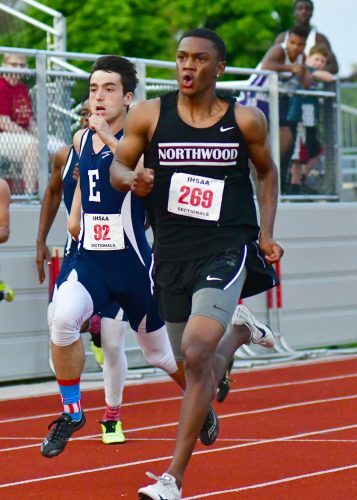 NorthWood’s Terrell Pratcher will compete in the 400 at the State Finals. The State Finals will see several area seniors wrap up their high school track careers. Warsaw will be represented by senior Justin Fleming in the 1,600. The Tigers’ will also have its 4 X 800 relay team of seniors Taylor Mills and Xavi Ramirez, along with junior Nolan Groninger and freshman Tanner Stiver in the mix. Junior Hunter Metzger is set to compete in the pole vault for Warsaw. The Tippecanoe Valley program will have a pair of athletes in the mix. Seniors Dakota Parker and Jameson Baker will be in action with Parker in the 400 and Baker in the shot put. Parker placed 24th in the 400 at the state meet a year ago. Senior sprinter Terrell Pratcher will represent NorthWood. The standout will compete in the 400. The biggest attraction and story line at the boys finals should be Nate Patterson. The Plymouth senior will be shooting for a state record in the high jump. Patterson won the regional title at Warsaw last week as he cleared 7-3 1/2, the top jump ever in Indiana and the best jump this year in the nation. Official state records have to be set though at the state meet. Patterson won the state title in his specialty a year ago as he cleared 6-10 in Bloomington. Patterson, who is headed to USC, also won the regional championship in the long jump as he sailed 23-2 1/2, a school record for the event. Patterson, who only competed in a couple of long jump events prior to the regional, is also the top seed in that event at the State Finals. Patterson, who is 6-6, will be aiming to best the official state record which is 7-1 1/4. That height, which was originally reached in 1977, is shared by three jumpers and was last reached in 1980. Thee boys state meet begins at 3 p.m. Saturday with the pole vault, long jump and discus events. The 3,200 relay finals kicks off action on the track at 4:15 p.m.